Of all your bulldog’s senses, his sense of smell is the most important. Everything about your bulldog’s sense of smell is superior to yours. Consider the number of scent receptors in your nose. You have 6 million, but your bulldog has 300 million! A nose that powerful deserves special care and attention, right? Unfortunately, bulldogs are prone to a few nose problems, but understanding them will help you keep your bully’s sniffer in tip-top shape. 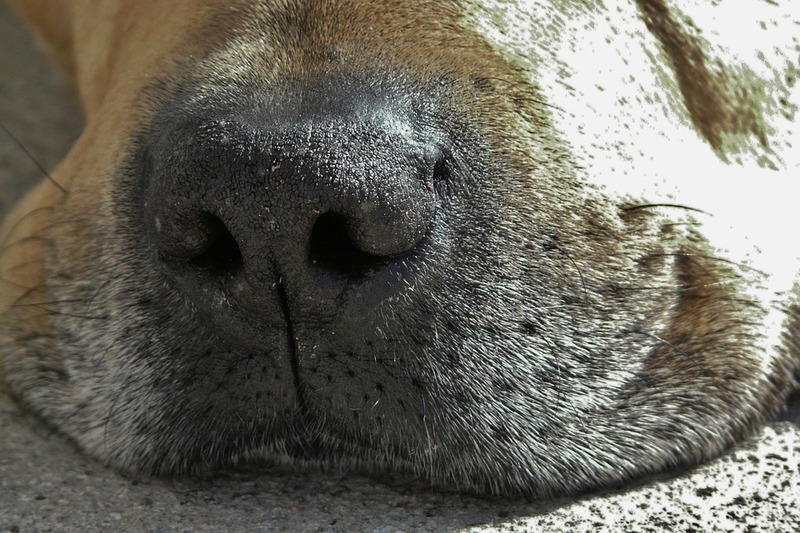 Here are 3 bulldog nose ailments that require special attention. If you have a bully, you are probably already familiar with the term nose rope. Nose rope refers to that adorable wrinkle over your bully’s nose. Some bulldogs have really deep nose ropes, and without proper care, they can become painfully inflamed and infected. As with skin folds, nose ropes are breeding grounds for bacteria and yeast. The nose rope can be even more problematic in some bulldogs when tears keep the wrinkle of the nose moist. In order to keep your bully’s nose rope healthy, you must keep it clean and dry. How will you know if your bulldog’s nose rope is inflamed or infected? The symptoms are swelling, redness, bad odor, yellow discharge, and/or bleeding. In addition, your bulldog may rub his nose on the floor in an attempt to alleviate the pain. If your bully develops a nose rope problem, you will need to use medicated wet wipes and contact your vet. Your bully’s nose should feel cool and moist to the touch, but there are many factors that can cause it to become rough and dry. Typical causes are extreme weather, sun exposure, allergies, dehydration, skin disorders, and other underlying medical issues. Dry nose is more common in the winter, especially if your bully spends time in front of a heater. Regularly applying petroleum jelly to your bulldog’s nose is a good way to keep it healthy. Food and household cleaners are other common allergens. If you are unable to heal your bully’s dry nose with petroleum jelly or by eliminating an allergen, you will need to take your bulldog to the vet. Stenotic nares are narrowed nostrils. They restrict the amount of air flow into the nostrils, and they can cause serious breathing problems for your bully. 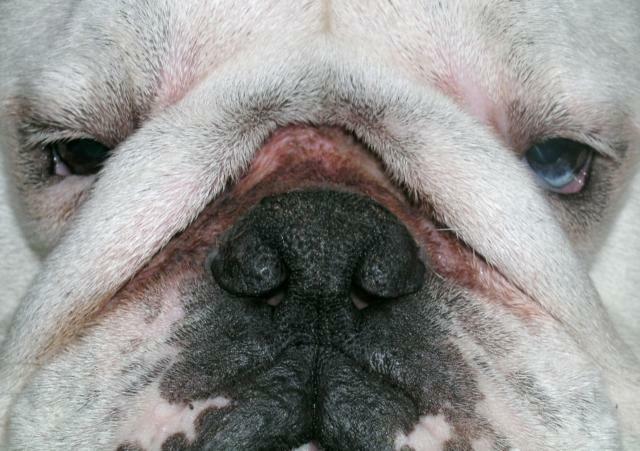 It’s a common disorder in brachycephalic, or short-nosed breeds, and Frenchies tend to have stenotic nares more commonly than other bulldogs. Symptoms include noisy breathing, snoring, snorting, coughing, gagging, vomiting, and fainting after exercise. 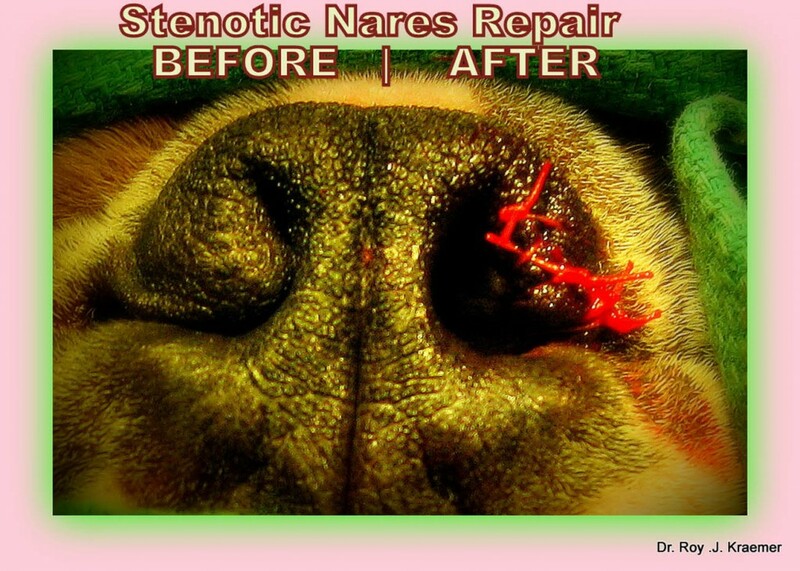 A visual inspection is all it takes for a vet to diagnose stenotic nares. Many techniques exist for lessening the breathing problems caused be stenotic nares, and they include weight loss, controlled exercise, medications, and oxygen therapy. However, the only cure for stenotic nares is surgical correction involving the removal of a wedge-shaped piece of each nostril. Prevention and awareness are the best ways to ensure that your bully’s nose stays healthy, and nose care should be part of your bully care routine. 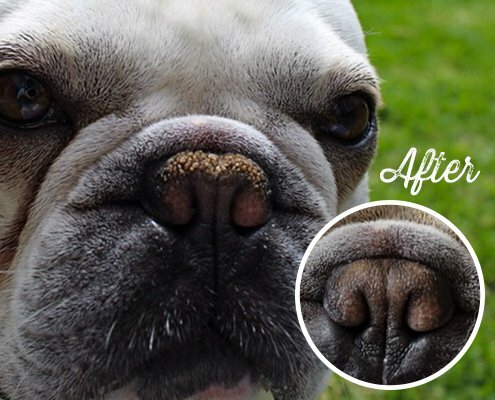 With regular cleaning and moisturizing, your bulldog’s nose should stay kissable and cute!